Personally, for easy drinking I enjoy the ‘joven‘ wines, this translates as ‘young‘, but actually means that the wine has had little or no oak ageing – less than a Crianza gets anyway. On my trip I was able to taste quite a few red Riojas made using carbonic maceration, which extracts colour rather than tannin, just as they do in Beaujolais. I didn’t rate many of the examples I tried – they seem to be more of a Spanish thing, but the 2009 Bodegas Artuke Maceración Carbónica was extremely well made and pretty enjoyable in a soft, fruity style. 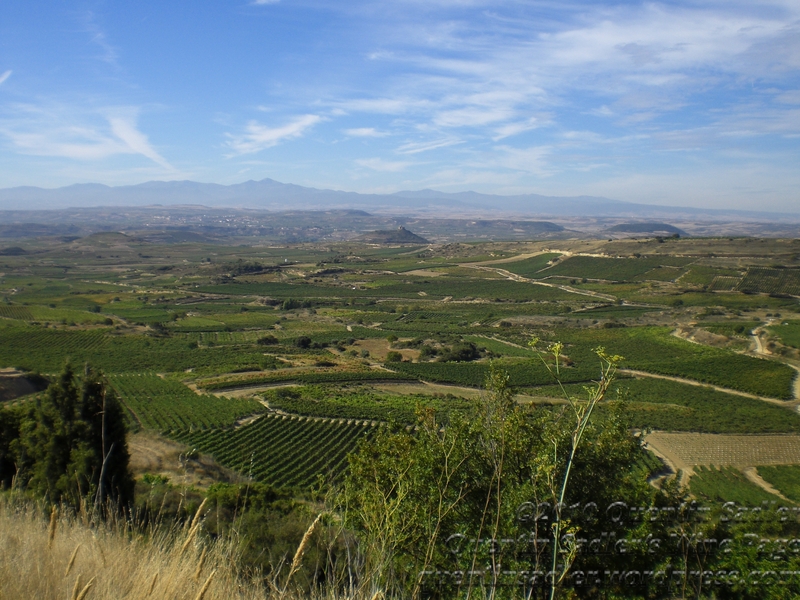 The best example I have ever tasted was also from Rioja Alavesa – 2009 Remírez de Ganuza Erre Punto Tinto Maceración Carbónica – but these wines are hardly ever available in the UK. It is the Reservas and Gran Reservas that most people think of when their thoughts turn to Rioja. Rightly so, I think, as these wines made in finer vintages from selections of the best grapes can be very fine indeed when made by an expert bodega – however, the really good ones are becoming a little pricey. So, what should a Rioja drinker do? Well, I have a soft spot for the Crianza level of Spanish wines, they can be very good and provide great value drinking at that. Crianza means ‘raised‘ or ‘nursery‘, meaning the wine is raised in oak or aged in oak, but not for as long as a Reserva or Gran Reserva, which can mean that they retain lovely fresh fruit. 100% Tempranillo grapes – aged 12 months in new American oak barrels. Dried brambly fruit nose with gentle spice and wafts of sweet vanilla. Smooth, medium-bodied and very soft palate with some leathery characters and dried, blackberry fruit notes. Very supple and good quality easy drinking with a well balanced finish and some length. This is currently available (October 2010) at just £3.99 a bottle from Wine Rack stores. 100% Tempranillo grapes – aged 12 months in French & American oak barrels. Fresh, deep red fruit nose with some spice, coffee and leather notes. The palate is very smooth and elegant with good acid balance as well as well integrated oak that barely shows, merely enhances. Great concentration of fruit with dry spice notes and elegance on the supple fresh fruit palate that gives that touch of complexity. The finish has lovely freshness that enhances the elegant feel of the wine – 90/100 points. £10.49 a bottle from Wine Rack stores. 100% Tempranillo grapes – aged 12 months in American oak barrels. The nose has very attractive red and black fruit notes with a dusting of delicate spice. Very supple palate, medium-bodied Rioja with that slightly warming, gently spicy vanilla American oak character that is the hallmark of the style. £8.99 a bottle from Majestic – £6.74 if you buy 2 bottles of Spanish wine in October 2010. 80% Tempranillo with 20% Garnacha & Mazuelo grapes aged 12 months in American oak barrels. £7.99 a bottle from Majestic – down from the normal £8.99 – £5.99 if you buy 2 bottles of Spanish wine in October 2010.